Geneva is probably the non-profit capital of the world and therefore a natural target for Drupal. Development Seed, who specialise in non-profits, called this meeting as they were passing through soliciting clients. Development Seed have invested a lot in growing the community in Washington DC and there are now three groups in that city. This meeting was attended by a mixture of developers, organisations using Drupal, and organisations considering Drupal, 16 people in all. I opened the meeting with a few words about growing the community and the intention to start a 'Geneva Web Collective'. Then Eric Gunderson talked about strategies for growing communities. Marla Petal from RiskRed(considering drupal) talked about a project she's leading to deliver re-usable disaster preparedness education training source materials in many languages. Finally Florian (developer) wielded his laptop and showed us his new garland sub-theme which uses semi transparencies to maximise the effect of changing the background colour. There will be a meeting next month, announced on the Switzerland group. 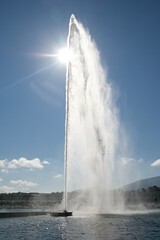 There is definitely enough interest to sustain a group in Geneva. Thanks to Dev Seed for picking up the tab!